Circus is a name for a traveling company of performers. These performers are usually acrobats, clowns, and trained animals although there are circuses that have musicians, trapeze acts and other stunt artists. 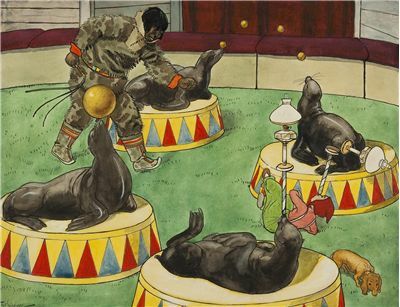 Circuses usually perform in a circus tents. Today, circus is more of an art form than a pure show. Some say that history of circus begins in 18th century. 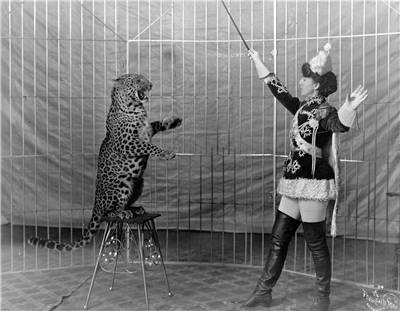 Some say that history of circus begins in ancient Rome. We believe them both and talk about all important points from the circus origins here. Circuses strive to be colorful and to capture attention of the audience. They enlist a variety of people with different skills and they train different animals many tricks to achieve that. And in that striving they can go too far. As we all know wild animals can be dangerous, heights can be dangerous and neglect can be dangerous. Mix all that together and you get a big part of the circus. These aspects brought to some of the greatest accidents in the history of circus. Some say that circus appeared for the first time in 18th century and if we look for the origins of modern circus they are maybe right. But the first circuses appeared in Ancient Rome and were that places where horse and chariot races were held, along with staged battles, gladiatorial combat and displays of trained animals. The circus of that time was the only public spectacle at which men and women were not separated. The earliest circus in the city of Rome was the Circus Maximus built in the Old Kingdom era. When it was finished it could receive 250,000 people and it had 400m in length and 90m in width. Other famous circuses of Roman era were Circus Flaminius, Circus Neronis and Circus of Maxentius. Beginning of the modern circus starts in 18th century with Philip Astley, a cavalry officer from England. He opened in Lambeth, London on 4 April 1768, an amphitheater for the display of horse riding tricks. Tricks were not his invention but he was the first to build a place for their performance in front of an audience. He called this performance arena a Circle and the building an amphitheater but they became known in time as Circus. Andrew Ducrow continued after Astley and was at time proprietor of his Amphitheater. The first mainstream clown was Joseph Grimaldi with his role of Little Clown in the pantomime “The Triumph of Mirth; or, Harlequin's Wedding” in 1781. Charles Dibdin and his partner Charles Hughes opened The Royal Circus in London on 4 November 1782. Astley exported his Circus to France in the same year as “Amphithéâtre Anglais” and then continued to build 18 more throughout the Europe. All these circuses were in especially built buildings for them. Tents appeared later. 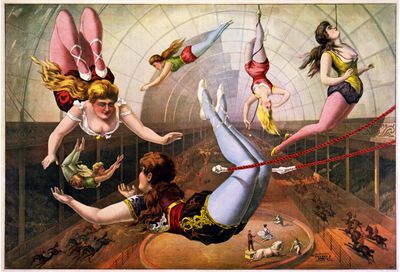 The first modern circus in the United States was one in Philadelphia founded by John Bill Ricketts April 3, 1793. “The Circus of Pepin and Breschard” toured from Montreal to Havana in the first two decades of the 19th century and they built many circus buildings along the way. 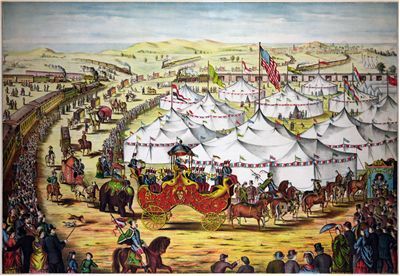 Joshuah Purdy was the first to use a large tent for his circus and he did it in 1825. Thomas Taplin Cooke brought tent to England in 1838. Because tents were easier to use they slowly but surely replaced circus buildings, retrofitted buildings and open spaces. One of the largest (if not the largest traveling circus) was “The Barnum & Bailey Greatest Show On Earth” which toured from 1897 to 1902 around the Europe. Under the wish by Lenin for the circus to become “the people's art-form” the USSR nationalized Russian circuses in 1919 and opened the State University of Circus and Variety Arts, better known as the Moscow Circus School, in 1927. What we call today as “Contemporary circus” (or “nouveau cirque”) appeared in the 1970s in many places like Australia, Canada, France, the West Coast of the United States, and the United Kingdom. This type of circus still has traditional circus acts but it combines it with theatrical techniques to tell a story or present a theme. Earliest examples of contemporary circus are: Circus Oz, formed in Australia in 1978 from SoapBox Circus and New Circus; Pickle Family Circus, formed in San Francisco in 1975; and Cirque du Soleil, founded in Quebec in 1984. Modern ones are the Tiger Lillies, Le Cirque Invisible, Dislocate, and Vulcana Women's Circus.